I confess, I have never figured out a more attractive way to share blog posts from outside websites. If you have any insight for this, please let me know! I wrote this while I was still waiting for my baby, but past the darkest days of our trial. I still mean it, probably now more than ever, and if you need to hear it right now, I sincerely hope it encourages you. I know some of you are in your darkest hour. I remember what it was like to be in the deepest depths of the pit of despair. I remember walking around my house and spontaneously bursting into tears, even surprising myself with the level of sorrow inside of me. I remember lying in bed, inconsolable and broken, literally crying out to the Lord in my weariest, tear-soaked voice, “Where are You? Where are You?” I remember thinking it was never going to get better. The Lord has not yet given me a child, but He did answer many of my prayers to make it better. 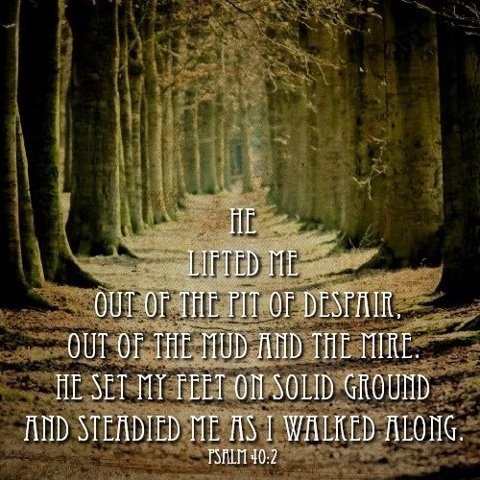 Little by little, He dug me out of the pit and provided the joy and strength I needed. It’s not always totally better, but it’s better than it was. And in remembering this, I think of so many of you who may be reading this, aching inside, dying inside, lying broken at the bottom of the valley. And you probably don’t need a lesson, a rebuke or even a Bible verse. You just need to be reminded: You’ll get through this. It’ll get better. You can do this. I know it seems unthinkable, relentless, unbearable and hopeless. But you can do this. This is not the end of your journey. There is hope — there is always hope. It’s bad now, but it will not always be like this. If no one else has told you yet, let me be the first: you’re going to get through this. You’re in good company. Before His death, Jesus pleaded with God to spare Him from the coming agony. God didn’t. On the cross, I believe, He had His time in the pit, as He was crying out, like you and me, “My God, my God, why have You forsaken Me?” But God came through for Him, and He will for you. If you are seeking advice, the best I can say for today is to start praying earnestly that God will give you what you lack inside. For me, it was real strength, joy, peace, and hope. And He will be faithful and give you those things. It may take a few days, weeks, even months. But He will not leave you in this pit. He will come for you. Reposted from November 4, 2013. I’m not sure if this will be encouraging to any of you, but I decided to share it just in case. She talks about how she handled grief when she lost her 20th child, among other things related to that. I know sometimes it can be a blessing to hear someone in a similar situation discuss it. Let me know your thoughts! Yes, I will walk through the valley if You want me to. Here is a perfectly poignant song for those of you who may be feeling like you’re in your worst days right now. I’ve been wanting to a write on this topic, but she says it so well I’ll just share her post! Joseph, favorite son of Jacob, was sold into slavery by his own brothers. The motive? That boy was daddy’s favorite, and they were jealous. Murderously jealous. In fact, if a tribe of Ishmaelites hadn’t shown up at just the right time, the original plan was to kill the boy, their brother, the favorite son of their father. It’s really a sad story. I can’t imagine being so totally rejected by my own brothers and sister. It would be heartbreaking. But this story has a truly remarkable ending. Joseph is raised up among the Egyptians. He becomes the number two guy in all of Egypt and prevents the people from starving during a severe, seven-year famine. He also finds himself in a position to make an important choice. A lot of you surely wrestle with the healing needed in your infertility, and wondering from where and when the healing will finally come. You have a lot of decisions to make in terms of medications, treatments and operations. No matter what road the Lord leads you down, may you always be sure that the healing is ultimately from Him and nothing else. What perfect peace there is in that! This is “Healer” by Kari Jobe.